Molly Brant and her brother Joseph were important characters in the Mohawk Valley of New York before and during the American Revolution. Today most Americans don't recognize their names, but in Canada they are remembered as heroes. Here is a little bit about her fascinating life. 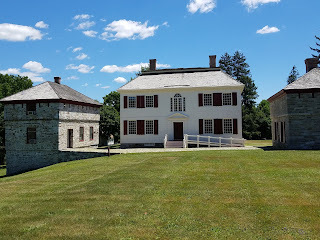 Mary's parent were christian Mohawks living in the Upper Castle, Canajoharie, on the south bank of the Mohawk River. The Native American towns were heavily fortified and the English referred to them as 'Castles.' Her birth year is estimated at 1736, her mother's name was Margaret Sahetagearat Onagsakearat. Her father's name cannot be confirmed but it is possible that she shared a father with her younger brother, Joseph. His father is known to have been Peter Tehowaghwengaraghkwin. The place of her birth is also unknown but has been speculated to have been in Canajoharie. At birth, Mary's Native name was Gonwatsijayenni, which means 'someone lends her a flower.' Later in life she went by Dagonwadonti, 'she against whom rival forces contend'. As the Mohawk are a matrilineal society, children belong to their mother's clan, in this case Mary and Joseph were part of the Wolf Clan. In 1759, 23 year old Molly began a relationship with the much older Sir William Johnson. He his wife, Catherine, had died. It is rumored he married her on her deathbed to legitimize his children by her. There is no proof of an English marriage between William and Molly, but it is possible they had a traditional Mohawk ceremony. In any case she moved into his home, Fort Johnson, and took the running of his household. She was sometime's referred to as the 'Brown Mrs. Johnson'. Molly gave birth to at least eight children. Sir William eventually built a larger house to show off his status and accommodate his large, and growing family. Together they entertained the leaders of both the Iroquois Confederacy the English Colonies, political, military as well as businessmen. Her home was open to any and all and she and Sir William entertained constantly. In 1763 they moved into the larger, grander Johnson Hall. John Johnson, Sir Williams legitimate son and heir took over Fort Johnson. Sir William passed away in 1774. In a way, his death symbolized the death knell of English rule in America. Already the seeds of revolution were germinating in the thirteen colonies. Molly relinquished control of Johnson's estate to his eldest son and heir, Sir John Johnson and moved with her children to Canajoharie. Molly supported the efforts of her brother Joseph, who lead a group of white Tories and Mohawks. She eventually landed at Carleton Island for the duration of the war, trying to broker peace between unhappy Mohawks and the English. After the war she was awarded a pension from the crown and settled in Kingston, Ontario, on the mainland. Today, Carleton Island is part of the United States. Five of her daughters married Canadians. She had one son who survived, George, who worked for the Indian Department. Molly lived in Kingston for the rest of her life. She died in 1796. Sir William's heir attempted to reclaim their lost American property, to no avail. 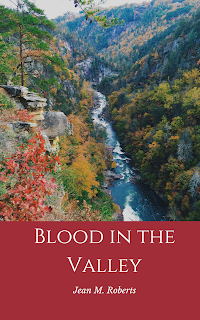 Blood in the Valley is my next book, in its final editing stages, it should be available Spring 2019. Molly and her brother feature in this novel set before and during the American Revolution. UPDATE: It has been released! Get it now on Amazon. 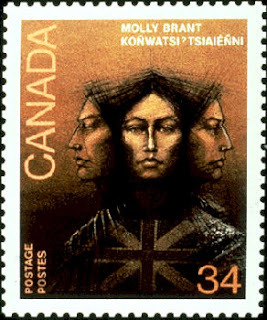 Peggy Dymond Leavey, Molly Brant: Mohawk Loyalist and Diplomat, (Toronto: Dundurn, 2015). Isabel Thompson Kelsay, Joseph Brant, 1743-1807, Man of Two Worlds, Syracuse, New York: Syracuse University Press. Barbara Graymont, “THAYENDANEGEA,” in Dictionary of Canadian Biography, vol. 5, University of Toronto/Université Laval, 2003–, accessed December 13 2018. The Editor of the Encyclopedia Britannica, "Mary Brant", Encyclopedia Britannica (https://www.britannica.com/biography/Mary-Brant : accessed 13 December 2018).